Don’t Worry About Low Park Power Again!! For use on single phase, 3-wire services. Can be used on 120/208V, 3-wire network. 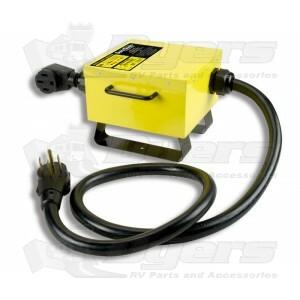 This product is for use on single phase, 3-wire services but also can be used on 120/208V, 3-wire network.The Voltage Regulator continuously monitors line voltage conditions and increases voltage to provide a very stable regulated and reliable source of power to the coach or travel trailer. The unit also helps prevent low voltage damage to appliances. This is a fully automatic Voltage Regulator which makes it very easy to use. An optional mounting bracket is also available for mounting the regulator inside your RV. Fully automatic – Continuouslymonitors line voltage conditions.